It's no secret that WND is no fan of the gays and their marriage. And, like all good conservative rags, it considers part of its dedication to honest journalism to be exposing all the evil instances of the gay lobby pushing its agenda on innocent and wholesome American activities, be they school (how dare schools teach about gays!) sports (how dare the Chicago Cubs say they welcome all their fans!) or that most hallowed of American literature, the noble comic book. Wait, say that last part again? There's no question there's an agenda here, but the reality is that most comics (or books, or movies, or TV shows) have an agenda. If you think Superman or Batman don't have agendas, you're not paying attention. 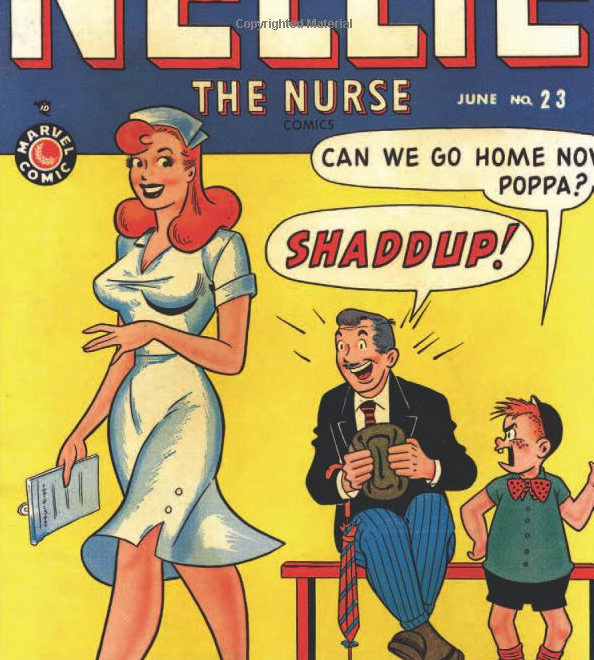 Also, while it's true that historically this comic tended to be pretty wholesome, I wonder if folks like Spriggs would be choosing it to be a rallying cry for how gays are ruining comics if they knew a little more about Archie's creator, Dan DeCarlo. 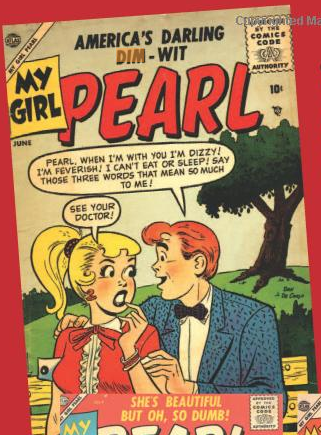 Yes, before his breakthrough with the Riverdale gang, Dan DeCarlo wrote and drew such innocent all-American works as Millie the Model, Sherry the Showgirl, and "America's Darling Dim-wit" My Girl Pearl. He seemed to really have a thing for showing young ladies in various stages of undress. If you look carefully, I'm sure Archie afficionados will recognize DeCarlo's signature faces at work in his early strips. Why look, this extremely perky nurse is a dead-ringer for that sadistic millionaire-ess, I mean, hardworking capitalist Veronica. And this creepy slobbering kid is clearly Archie's evil identical cousin. So yes, there may be a point here about the dicey issues of mucking around with an artist's characters after their death (I don't look forward to the inevitable day when Uncle $crooge competes in a break-dancing competition) , but don't act like a gay wedding in Archie is inappropriate because it somehow tarnishes DeCarlo's pure family-friendly vision. Considering that most present-day conservatives finding DeCarlo's old work from the '50s and '60s would want them banned if not burned, they should really just be happy that all the participants in this gay wedding are clothed.